Maybe I’ve grown old and jaded, but this year’s crop of nominees for Animated Film all lack the depth and nuance I’d expect from the top tier, and the more comedic films never hit a high level of humor. I was incredibly disappointed with Frankenweenie, the Tim Burton film with a John August writing credit. The film had an interesting premise of an appropriately Burtonian town filled with children who were classic horror movie types, and a shy, alone main character who bring his best friend, his dog, back to life. But the movie seemed to give up there, resting on the laurels of its premise and not doing anything terribly interesting with it. And I cringed at the teacher’s heavy-handed diatribe against those who didn’t like science (not that I necessarily disagreed). 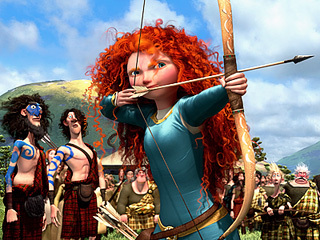 It somewhat famously took the animators several years to perfect Merida’s curls in Brave. I respect and admire the art, but the time and energy probably should have been spent figuring out what, exactly, the story was. The film went through that director switch, and while it is probably too easy to blame things solely on that change, I never felt a singular vision beyond the not terribly subtle “Mother and daughter fight and make up” plot that felt stale. It is a shame, because some of the side pieces, like the triplets and the scenes of the clans fighting were actually quite funny. ParaNorman frustrated me because it felt so close to something special. The film wastes a lot of time on cliches, underdeveloped characters, and an unsatisfying climax. And, you know, not to put this all on ParaNorman, but at some point, enough is enough with the films aimed at younger audiences with a main character who everything thinks is weird but has some special gift that ends up saving the day. Anyway, the film got close to some really interesting stuff: the dreamlike sequences, the kinda harrowing history that brought these events about, a throwaway line establishing the first openly gay animated character in a major release that I can remember. But it kept backing away from anything challenging. The Pirates! Band of Misfits had one of the funniest trailers of 2012. Unfortunately the rest of the film couldn’t keep up that pace. There were some quite funny bits in the movie, but they weren’t as frequent as I’d really like to see. The story was…rather weird, but I can kind of appreciate that. 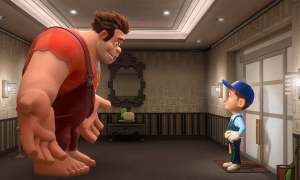 My lofty expectations for Wreck-It Ralph were not met, but I still found it to be the best of the bunch. The premise was pure brilliance, of course. I was surprised by how much the film seemed aimed at a younger audience. Not that there’s anything wrong with that, of course. But a movie with so many early video game references would seem to be ripe to cut across all ages. Still, the story was generally engaging, and the voice casting was very well done. This is a pretty stellar group of nominees. I saw 12 of the 21 eligible films and all the nominated films were in my top six or seven and all of my favorites are accounted for. So, on the one hand Jared doesn’t know what he’s talking about. On the other hand, I can understand his frustration that nothing is really blowing him away. But as a frequent watcher of this award, I can attest that is par for the course. There’s usually a lot of junk filling out this category – Puss in Boots, anyone? – so it’s nice to have a solid lineup. If Jared is underwhelmed now he should go back and check out previous years’ slates. I kept getting drowsy during Wreck-It Ralph. I don’t think it’s the movie’s fault and I’ve been wanting to give it a second chance, but I mention it to convey that I may not have the most trustworthy opinion on this one. Still, it never seemed to live up to its clever premise. I kept waiting for an emotional payoff that barely ever came and much of the story in the Sugar Rush game failed to grab me. I’ve also never been a gamer so maybe some of its humor and cleverness just went over my head. John C Reilly’s pretty fantastic, though. By the time of nomination morning I had completely forgotten about Pirates!. That’s my bad because it’s the funniest of the bunch. My take on it was that the story was mostly bizarre (part of it revolves around helping Charles Darwin score with Queen Victoria) and not terribly compelling on its own but I enjoyed the non-stop jokes and the fantastic characters. This cast of misfits could easily carry their own TV show. The film employs a mixture of stop-motion and computer-generated animation and the latter often looks a little rough, which is tough for a film set on the sea where there are plenty of CG water and clouds. Part of the plot revolves around the Captain’s desire to win Pirate of the Year, which results in several funny jokes about awards shows. Side note: the British title is The Pirates! In an Adventure with Scientists!, which is fantastic. I know I shouldn’t but it’s hard not to lump Frankenweenie and ParaNorman together given they are both stop-motion kiddie horror films. They both work well on that level and each has an interesting style, though Burton’s Frankenweenie goes the extra step of screening entirely in black and white. Frankenweenie goes a little dark, wallowing in its characters’ misery a bit. But ParaNorman gets seriously freaky in its engrossing and moving climax, much like Laika’s previous feature, Coraline. They end up conveying the same messages as any kids’s movie, but I enjoyed their darker paths to that destination. Both are totally solid and I’m interested in checking both out again, but I’d keep them from young kids. There have been a number of interesting articles out about the making of ParaNorman, including the hundreds of 3-D printed faces for each character, for anyone who is interested. to-follow-her-heart story is a bit played out. And, sure, there is a sense of, “They planned this story for years and this is the weird direction they decided to go with?” But its mother-daughter storyline at its heart really moved me and I loved the film’s look, not to mention its fantastic music. I can’t say I left the theater totally thrilled – it suffered from past Pixar comparisons – but it really hung around in my head for some time afterwards. Should have been here: I would have swapped out Ralph for The Rabbi’s Cat or perhaps The Picture, both inventive French flicks to be released in the US by GKIDS.